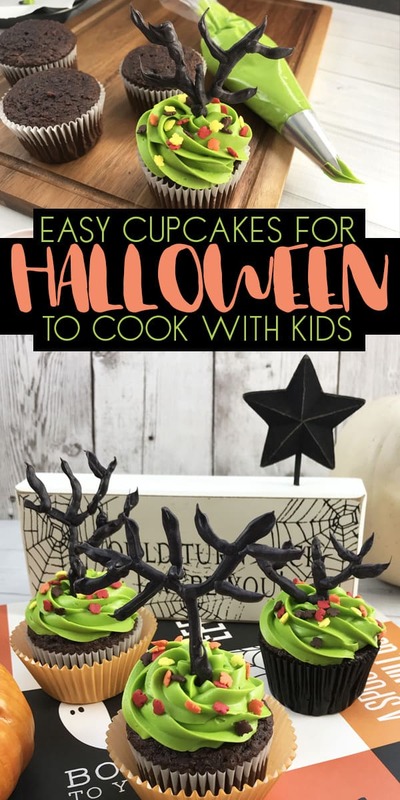 Kids love to decorate cupcakes especially if it’s easy. 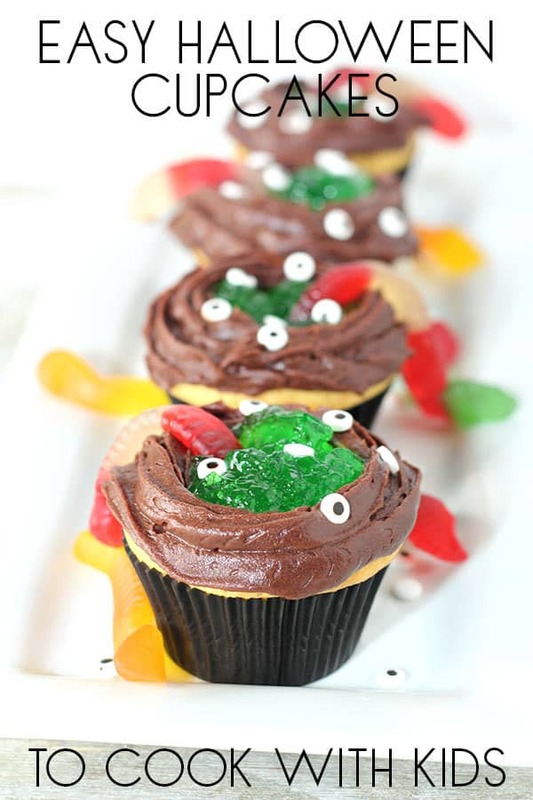 These Easy Haunted Tree Halloween Cupcakes are a perfect Halloween Recipe to cook with kids. 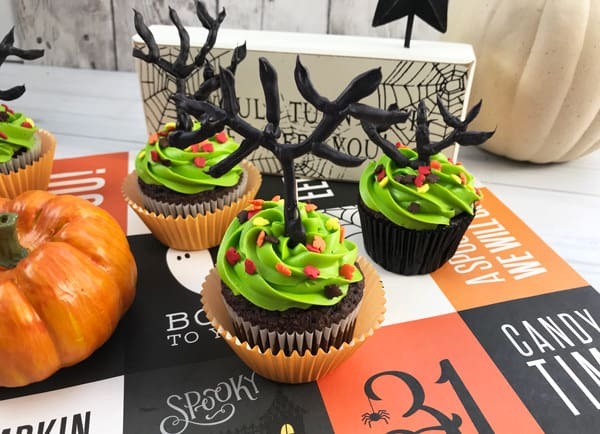 My kids loved to make the trees the most – although to be honest they may have also eaten a few more trees that we ended up adding to the cupcakes. These cupcakes are made with our simple chocolate cupcake recipe. 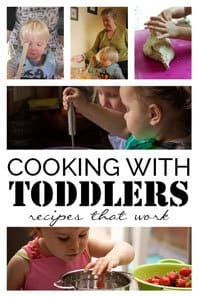 The kids love to make these quick and easy fairy cakes whenever they have a day off school and we’ve been making them since they were toddlers. 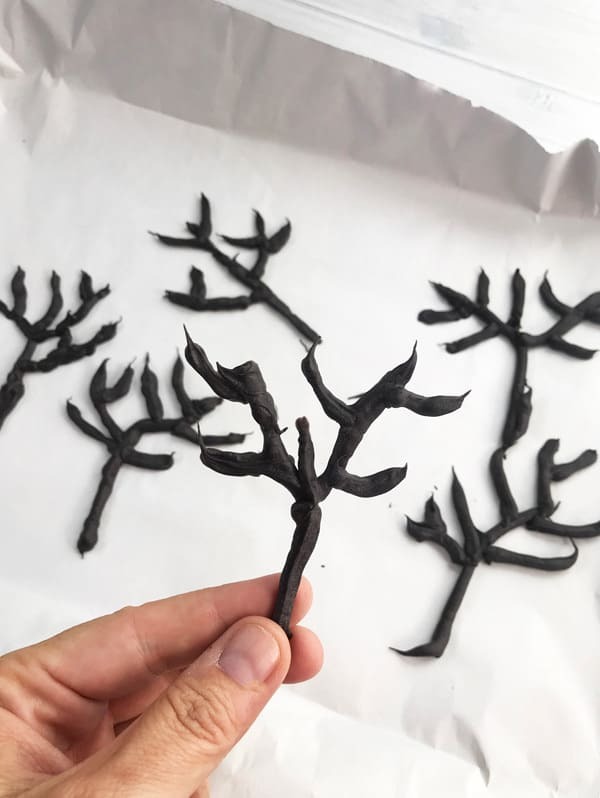 Candy Melts are really easy to use but a top tip is to add in a little oil – just a couple of drops will make it easier to use and when the kids decide to take a lot of time to produce their trees as the melted candy melts will stay smooth longer. 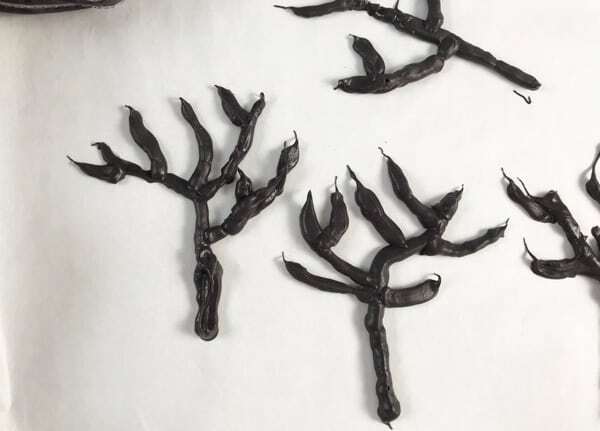 My daughter is a bit of a perfectionist so when it came to her creating the trees I drew a tree shape in marker on a sheet of paper and placed it under the wax paper so it could be seen and she could “trace” the shape with the black candy melts. If you don’t want to use candy melts then this can easily be switched with chocolate chips or even chocolate just watch the melting process so it doesn’t burn. 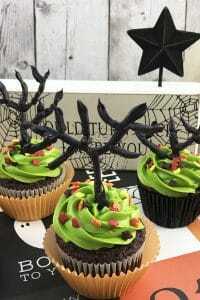 Create these simple Halloween Cupcakes with Kids with spooky haunted trees. 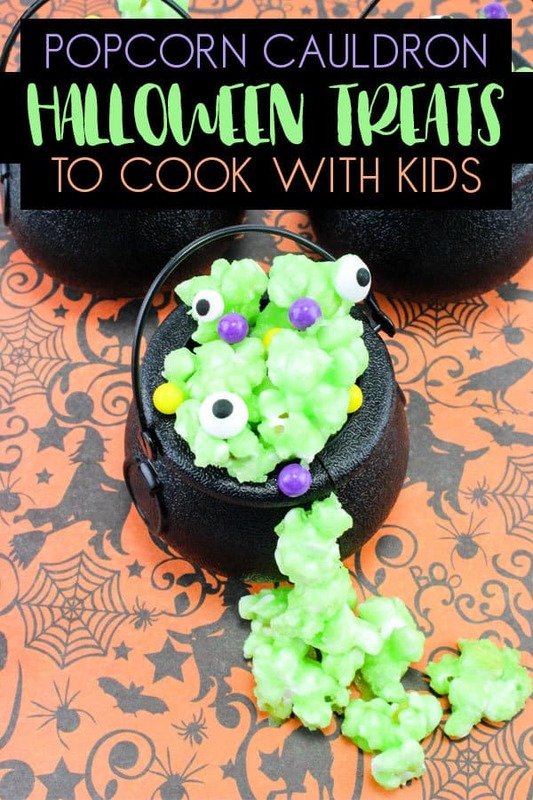 Fun to make and great to give as treats and for Halloween Parties. Make 12 cupcakes using the Basic Chocolate Cupcake Recipe. 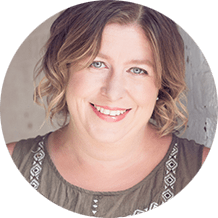 Line a large baking sheet with parchment or wax paper and set aside. Pour the black candy melts into a microwavable safe dish. Follow the instructions on the Candy Melts packet and adjust to your microwave. 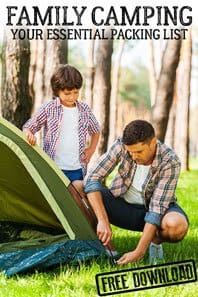 Check our top tip above. Leave the candy melts to cool a little. Add a few drops of green gel food colouring to the buttercream icing and stir to combine. Once the melted chocolate has cooled a few minutes, scoop some into a silicone pipping bag. 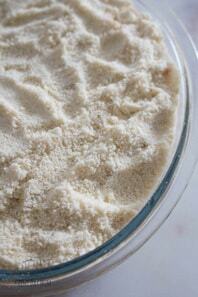 Use a small pipping nozzle gently squeeze onto the wax paper. Let the trees set. Too speed up the process place the baking sheet in the fridge for 20 minutes. Squeeze from the bottom to the top of the tree and then add the branches and smaller branches. 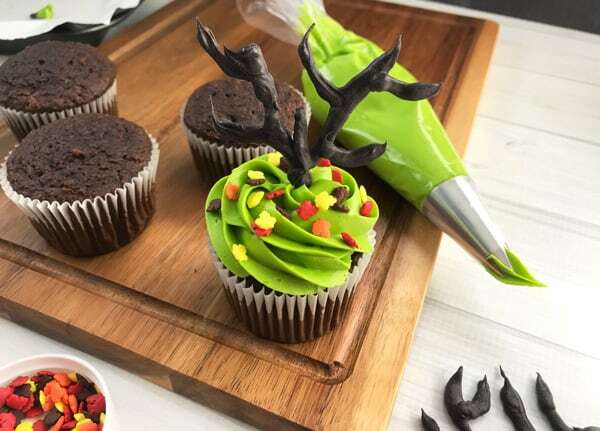 While the trees set on the wax paper fill another silicone pipping bag with your green icing and add a larger pipping nozzle. Swirl lots of icing on top of the cakes go from the outside into the middle. One the trees have set, place one in the middle of each cupcake. 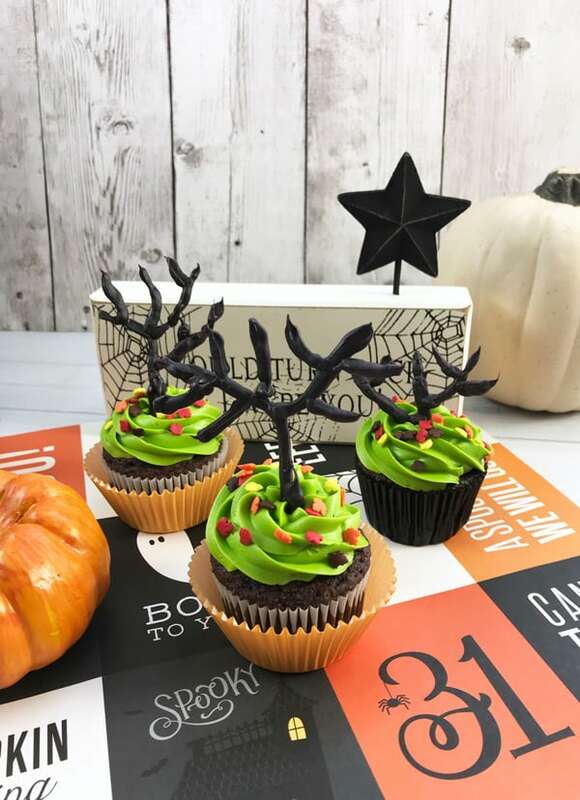 If it appears to have trouble standing - insert a toothpick directly behind it into the cupcake so the tree has some support until the buttercream sets. 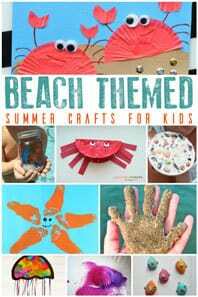 We have included links to the products we used to create this recipe. 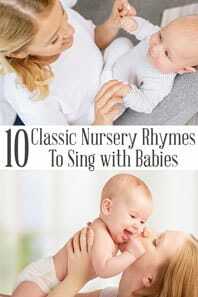 If you click and buy from the links on the images and in the text we may earn a small commission. With an effort to reduce our use of plastics we use silicone piping bags that are reusable. 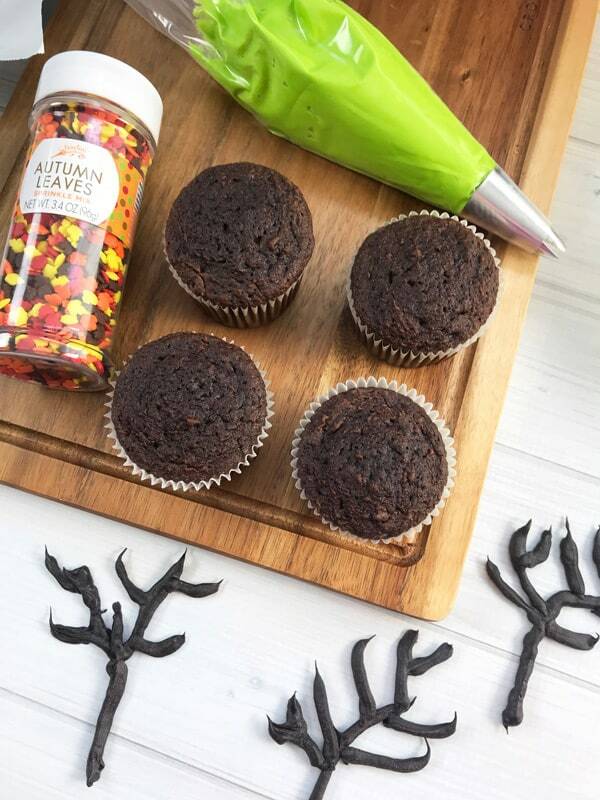 The one that we have comes with a set of different decorating nozzles which although we tend to use the same ones when I find a cupcake tutorial or cookie decorating idea I do experiment with. 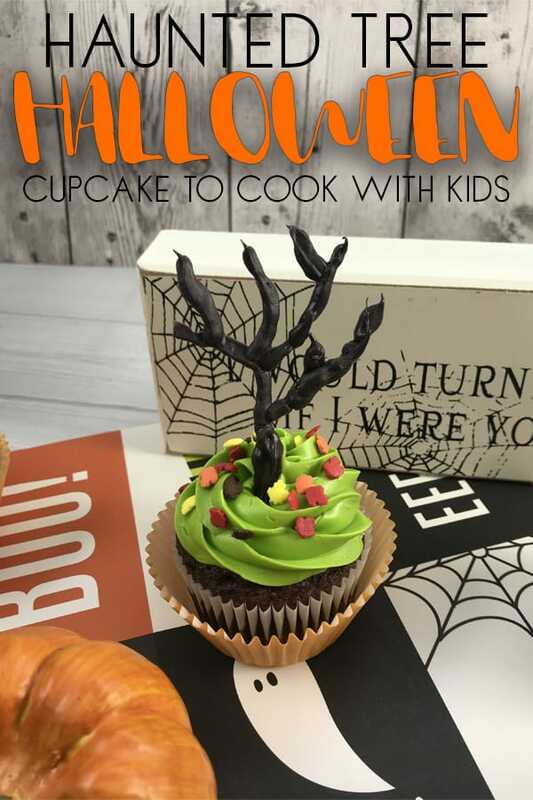 When we make cupcakes for party favours or like these which we will hand out for trick or treats this year I use paper cupcake liners. This Halloween Set is fun, I store them in a box and reuse them again next year. 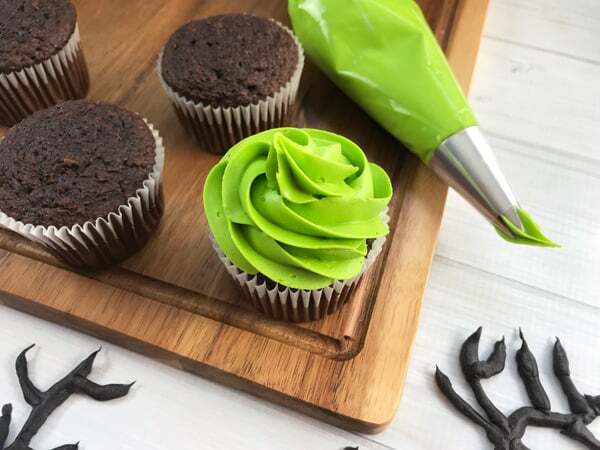 When colouring the buttercream to get a vibrant colour without losing the consistency of the icing you need to use pastes and gels rather than liquid food colouring. 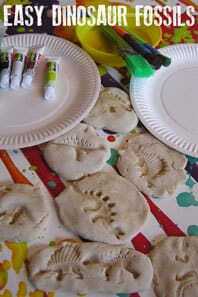 I have this set of Wilton Food Colouring Pastes that I use for Cakes and Cookies.